Cupcakes from Magnolia Bakery in NYC. Macarons from Pierre Hermé in Paris. Burgers from In-n-Out in SoCal. By a combination of reputation and hype, certain food establishments are destinations unto themselves - maybe even more than the cities they reside in. 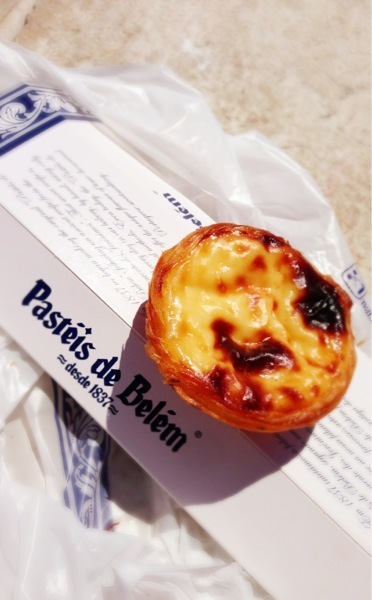 Pasteis de Belem in Lisbon is no exception. A traditional Portuguese dessert, pastel de nata is a custard egg tart (think Chinese dan tat but with a crust more akin to phyllo pastry), and this bakery just twenty minutes outside central Lisbon supposedly makes some of the best in the country. Lisbon wasn't part of my original itinerary, but with more time than I knew what to do with in Porto and rave reviews from an LCB friend who went last summer, I had no choice really but to go. Table service at Pasteis de Belem leaves much to be desired, but counter service is extremely streamlined; I had my tarts in a to-go box in a matter of minutes, and devoured them by the water after taking the tram back to Plaça Comercio. The verdict? Quite delicious, although I haven't tried any others while in Portugal so it's impossible to say whether they're the best. They also give you little packets of cinnamon and sugar to sprinkle on top, but alas I didn't notice these until after I finished eating and was throwing the bag away. Is "food tourism" an officially recognized term? Because it should be.